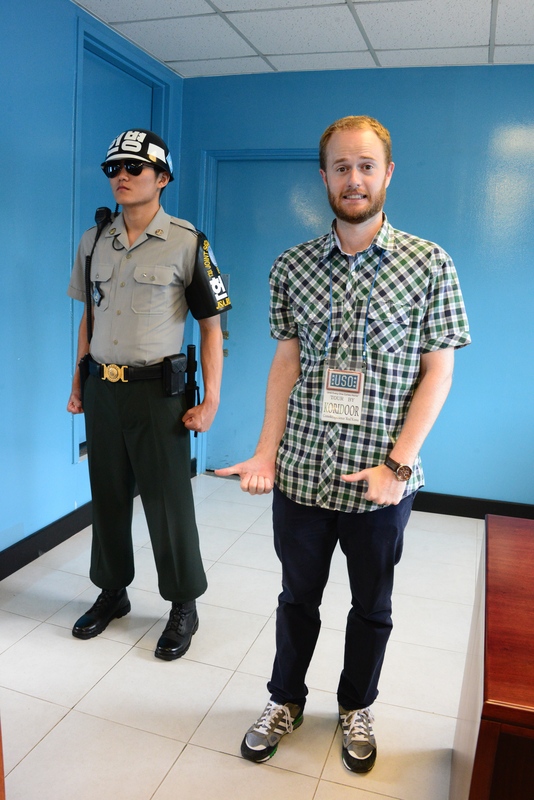 A few weeks ago, John and I, with two of our friends, went on the DMZ tour. For those who aren’t familiar with Korean history, the DMZ (Demilitarized Zone) is the border that runs between South and North Korea. I won’t go into details of the Korean war (you can read more here! 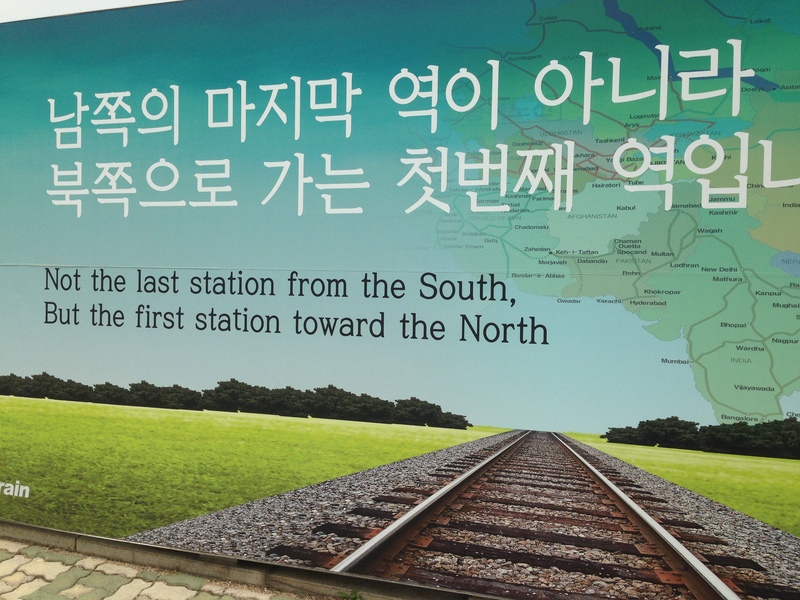 ), but anyone who is a little familiar with the two Koreas will know and be interested about the DMZ. 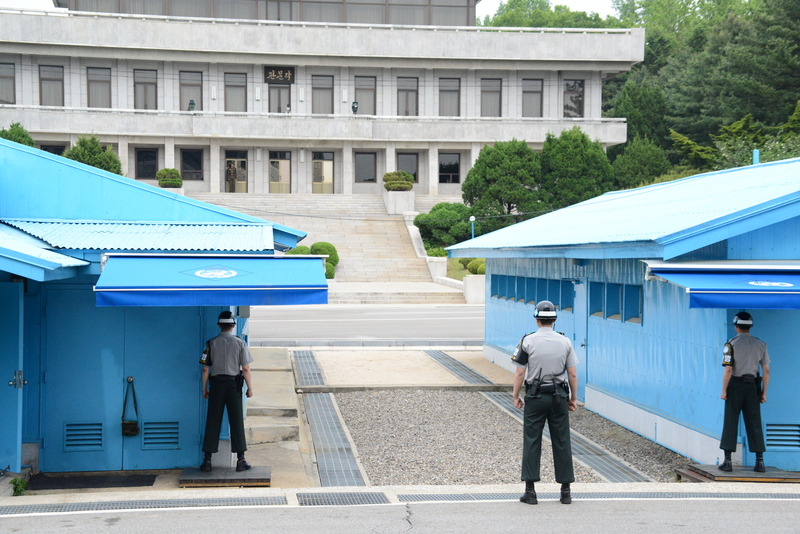 Since the Koreas never officially had an end to the Korean War, the DMZ is very heavily protected today. Being in Seoul, people often ask us if we feel any tension from North Korea. My answer is no. Honestly, I sometimes forget that they are right next door. 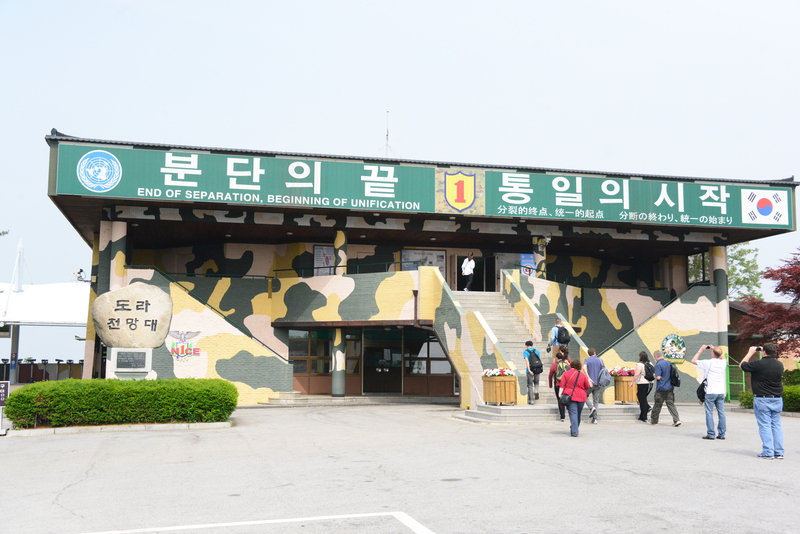 Going to the DMZ though, was a nice reality check that they are definitely there. It was a fun and adventurous experience! 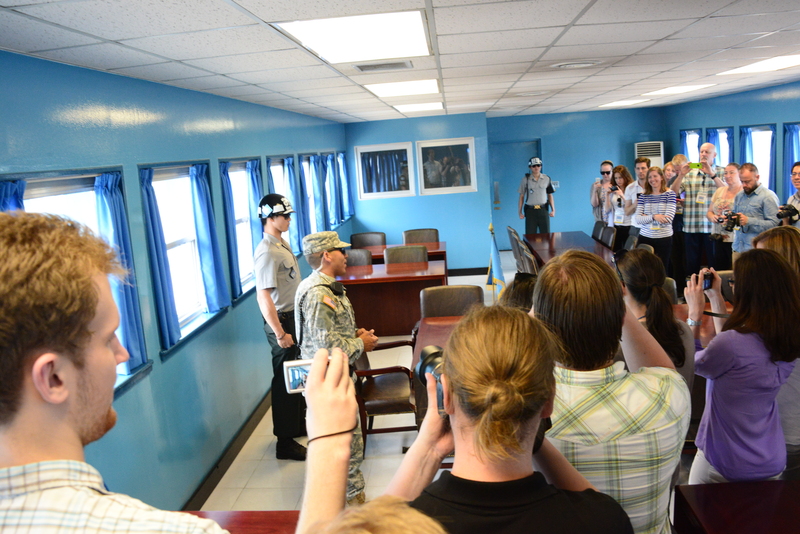 We went with a USO sponsored tour which means that we were able to be escorted at some points by American Soldiers. 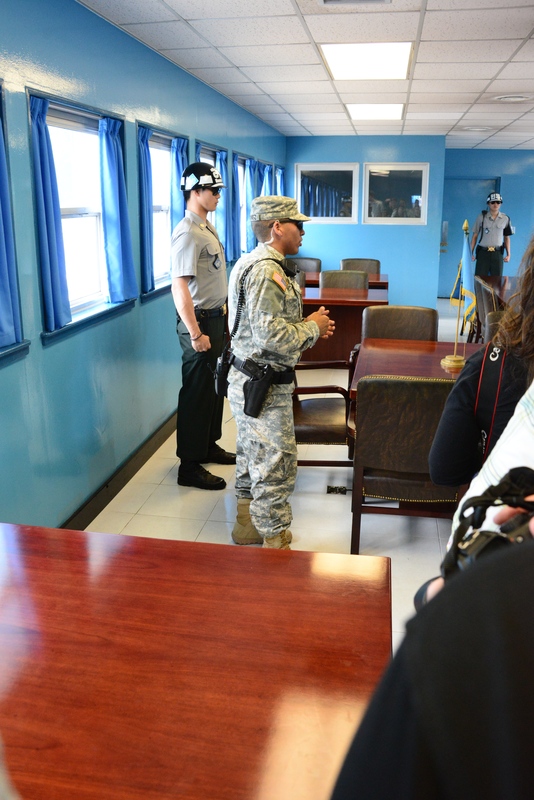 I have heard that the USO tours are the best and definitely the ones worth checking out! The company we went with was Koridoor tours, and it was definitely worth the trip. 10:30 : Arrive at and tour the Third Infiltration Tunnel. The Dora Observatory and Dorasan Train Station. 12:10 : Lunch is at a Korean Restaurant during the tour. 13:45 : Arrive at Camp BONIFAS. Receive the JSA tour brief from US Army Soldier at the JSA Visitor’s Center. 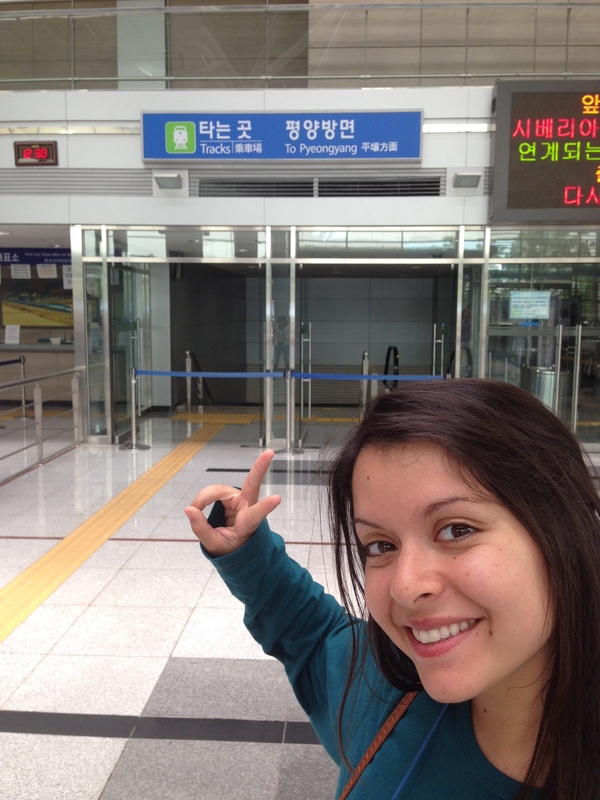 It was almost an entire day’s trip but definitely one of the best things that John and I have done while in Korea! I am not a big fan of history or writing about history, but I will recommend this to anyone who comes to Seoul! It really puts it into perspective how real the Korean war was and how active it still is today. 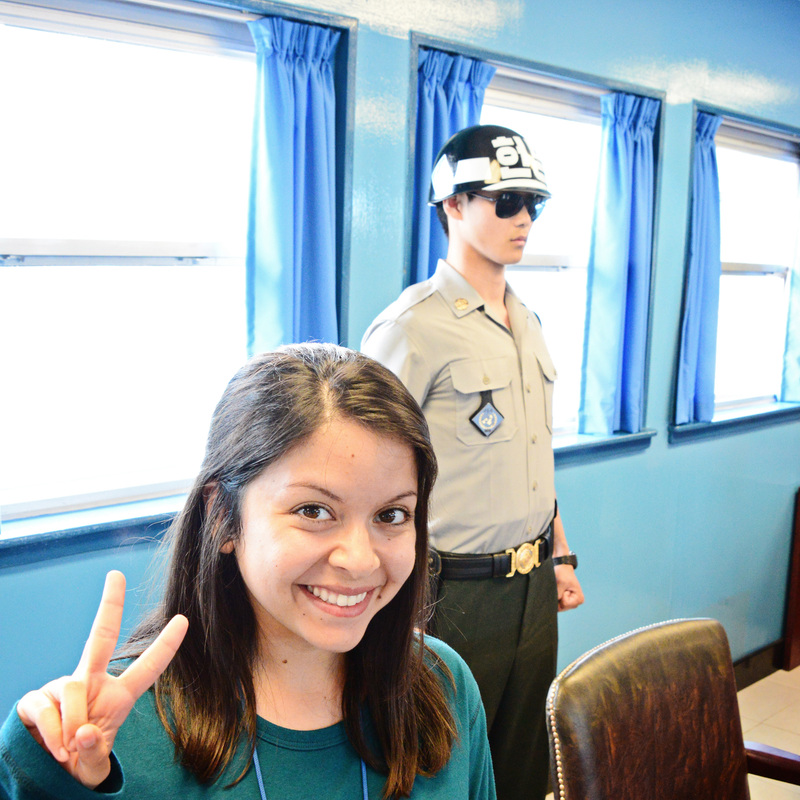 I feel like my blog post doesn’t do justice on how great the DMZ tour was, but it’s something I will always remember. Enjoy some of the pictures we took below! There are many places we couldn’t take pictures, but I’ll explain all the ones we could take! 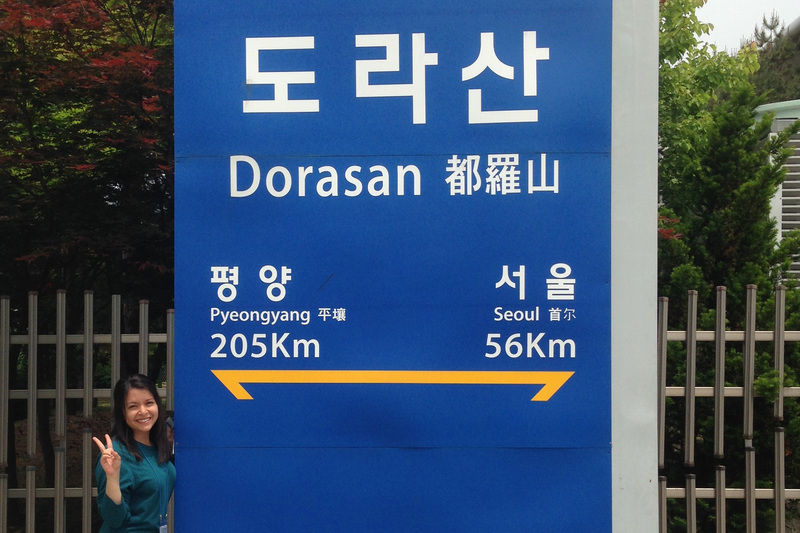 Dorasan is the train station that connects Seoul, South Korea to Pyeongyang, North Korea. It’s not in use, but there are hopes that one day it might be! 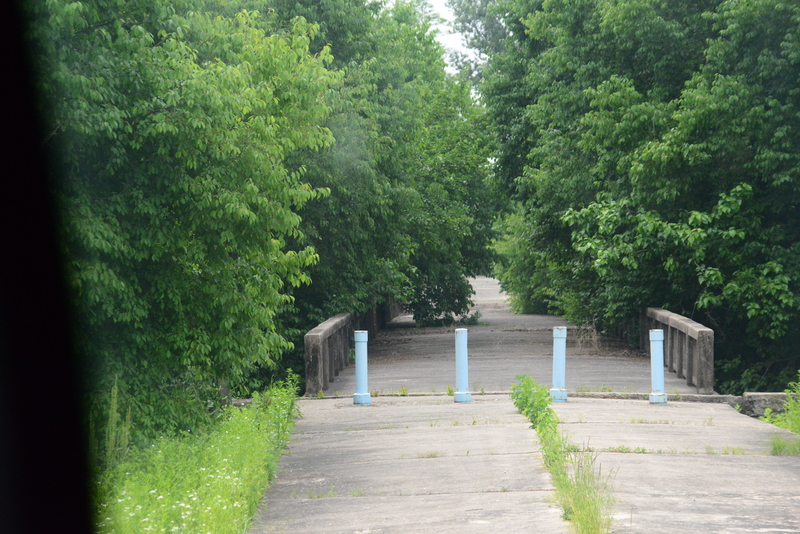 The Bridge of No Return – A bridge at the DMZ that connects the two Koreas. It used to be used as a prisoner exchange, but not sure if it still is used today. 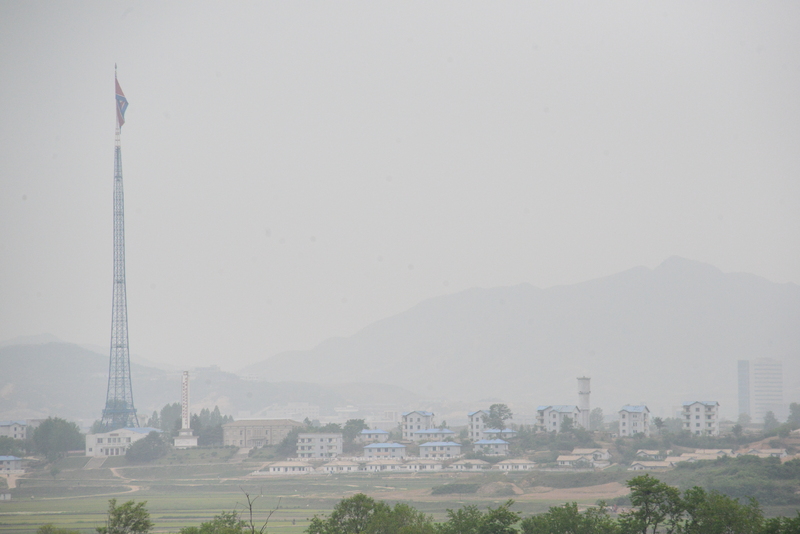 A village in North Korea – rumor has it that nobody lives there. 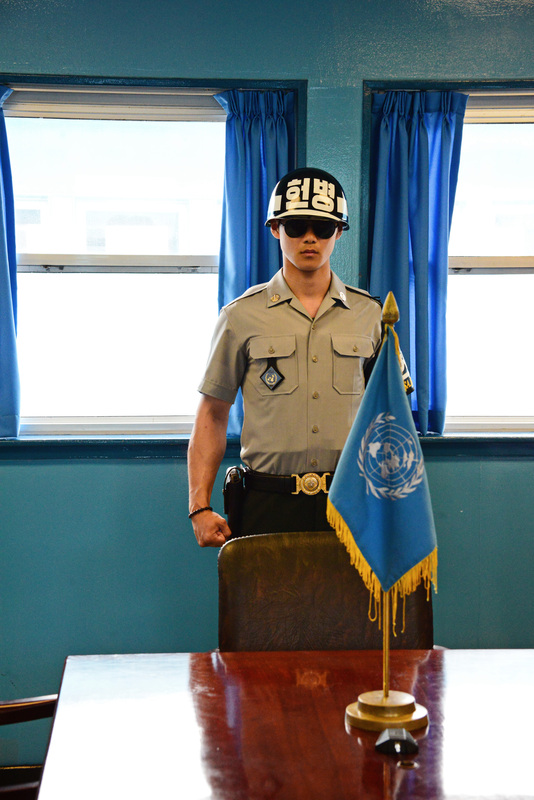 The DMZ border- South Korean guards protect it day and night. 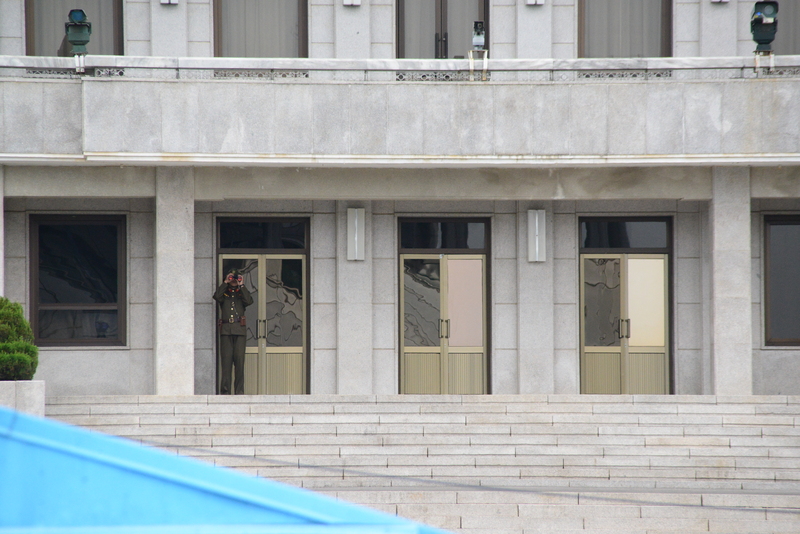 If you look on the stairs, you will also see a North Korean guard, on the North Korean side. 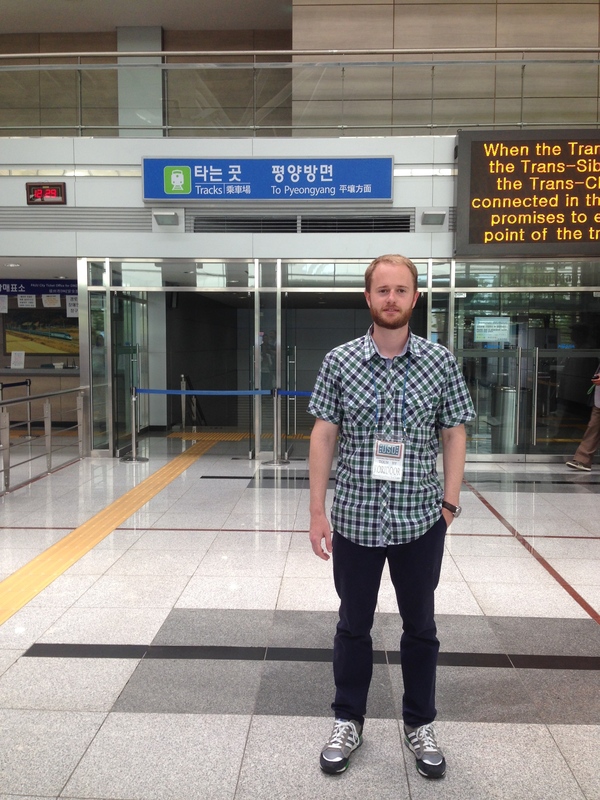 Standing inside the blue house where negotiations and meetings take place between the two Koreas. 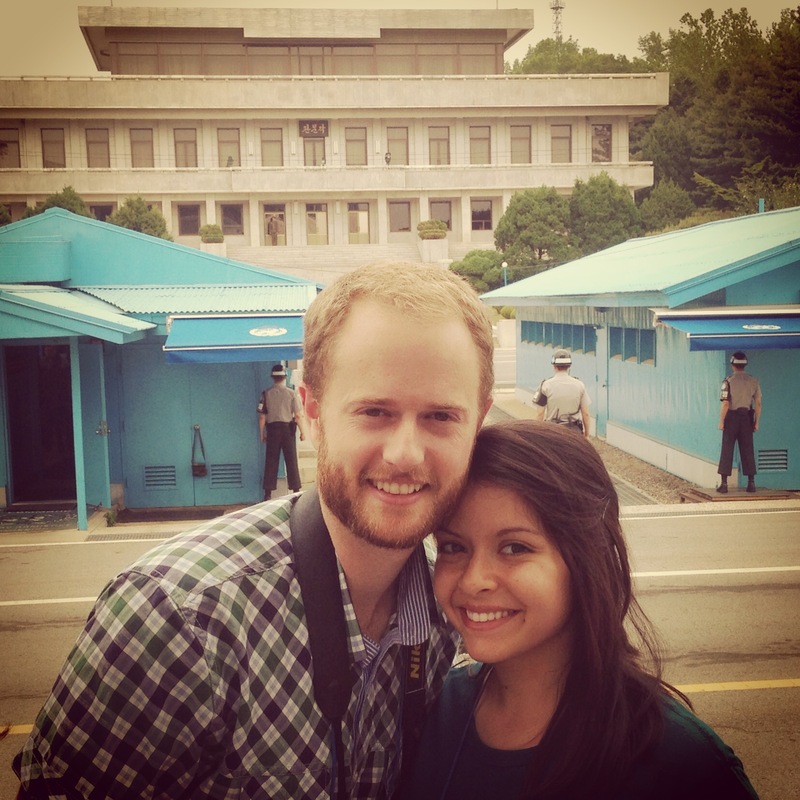 It was here that we were able to walk into North Korea. Whoa… Scary… I’m glad ya’ll weren’t in the middle of this. As a Korean, I have never been there in DMZ but we feel severe pain whenever we think that, do you know why we have this line and who made the line actually? From the past history, we don’t want to blame somebody but just what we want to know, we want to see the fact and from the fact, we want to see the present situation… that is the best way we won’t repeat the sad history. Anyhow thank you for this post and enjoy your stay in Seoul..